Replay Review upheld 3B Umpire Cory Blaser's fan interference call during Japan's WBC victory over Cuba on Tuesday as umpires Todd Tichenor, Fabrizio Fabrizi, Su-Won Choi and Blaser utilized local limited replay for the first time since the 2013 season, after which baseball expanded the technology to its central MLBAM location and eliminated video review at the ballpark. World Baseball Classic pool play still uses pre-2014's iteration of limited replay review. The fan interference/non-HR call also was yet another example of a popular misconception regarding interference base awards, and the incorrect concept that interference naturally harms offensive teams by depriving batters and runners the opportunity to run the bases. Crew Chief Tichenor upholds Blaser's call. The Play: With two out and a runner on second in the bottom of the 4th inning of the Cuba-Japan game, Japan batter Tetsuto Yamada hit a fly ball to deep left-center field and near the top of the wall, whereupon a fan caught the ball. 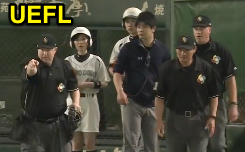 3B Umpire Blaser ruled that the fan had reached onto the playing field and interfered with a ball in play, awarding Yamada second base and baserunner Nobuhiro Matsuda home plate as the result of spectator interference. The Rules: Spectator interference is defined as occurring "when a spectator reaches out of the stands and over the playing field, or goes on the playing field, and (1) touches a live ball or (2) touches a player and hinders an attempt to make a play on a live ball." The World Baseball Classic is governed by the Official Baseball Rules ordinarily used by Major League Baseball; Rule 6.01(e) concerning spectator interference states, "When there is spectator interference with any thrown or batted ball, the ball shall be dead at the moment of interference and the umpire shall impose such penalties as in his opinion will nullify the act of interference." Rules Analysis: Contrary to popular opinion, the result of the play was not a ground rule double nor does interference necessarily result in an automatic two-base award. Accordingly, the broadcast's remark that the interference "cost Japan at least a base" was inaccurate, as the umpires ruled that had not interference occurred, batter Yamada would have achieved second base while runner Matsuda would have scored. Had the umpires believed that Yamada would have reached third base safely if not for the interference, they would have placed him at third base. Video Analysis: The reason that live video during home run/boundary fan interference calls tends to show batters/runners arriving at third (or another) base with relative ease, only to be sent back to a previous base by an umpire as if the interference "cost them a base" is that this live video tends to show the batter/runner only after—and, in some cases, significantly after—the interference has already occurred and the ball has become dead. Essentially, the video gives a false sense of how many bases the offense would have achieved if nor for the interference because the offense is basically running unopposed or uncontested by virtue of the ball being taken out of play. History of WBC Replay Use: Replay debuted at the World Baseball Classic in 2013, when Brian Gorman upheld his home run call during a Team Mexico-USA game in Arizona. Tichenor, who served as Crew Chief during Tuesday's pool play game in Tokyo, was also the plate umpire in 2013 for Mexico-USA.